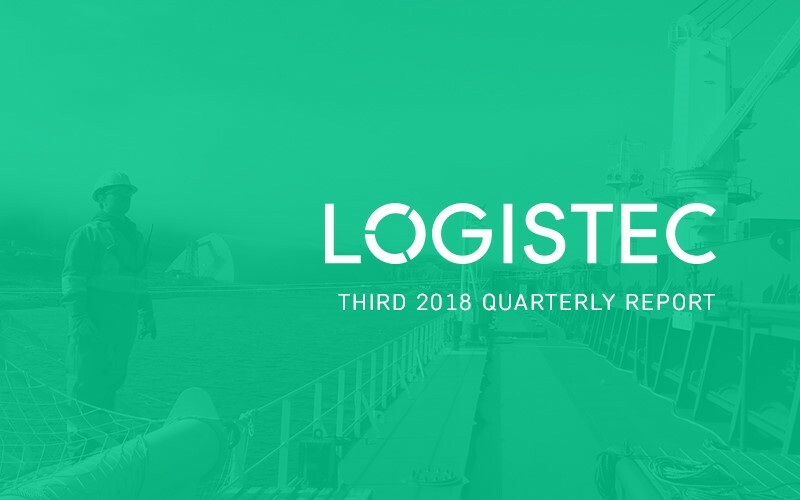 Montréal, Québec, November 7, 2018 – LOGISTEC Corporation [TSX: LGT.A and LGT.B], a marine and environmental services provider, today announced its financial results for the third quarter and first nine months ended September 29, 2018. In the third quarter of 2018, consolidated revenue totalled $184.5 million, an increase of $16.2 million or 9.6% over the same period in 2017. Revenue from the marine services segment rose by 79.4% from $53.7 million to $96.4 million, while revenue from the environmental services segment amounted to $88.1 million, a decrease of $26.5 million or 23.1% from the third quarter of 2017. The third quarter of 2018 closed with a consolidated profit attributable to owners of the Company of $22.3 million, compared with a profit of $11.0 million for the third quarter of 2017. The profit attributable to owners of the Company translated to total diluted earnings per share of $1.69, of which $1.62 was attributable to Class A Common Shares and $1.78 to Class B Subordinate Voting Shares. This strong performance is attributable in large part to the marine services segment, with revenue close to $100 million for the quarter and a profit before income taxes of $13.3 million. Furthermore, the acquisitions we made in this segment over the last two years, namely Logistec Gulf Coast, Gulf Stream Marine, and Pate Stevedore, were solid contributors to these results. In the environmental services segment, the profit before income taxes for this quarter improved compared to the same period last year, but performance was nonetheless lower than expected. This decrease can be explained by a lower activity level at FER-PAL compared to its record 2017 results. That being said, the combined backlog of Sanexen and FER-PAL totalled some $150 million as at the end of September 2018, a relatively high number for this time of year. This means that we will likely start 2019 with a substantial backlog, hence the positive forecast for our environmental services segment. During the first nine months of 2018, consolidated revenue increased to $416.2 million, compared with $330.2 million for the same period in 2017. The profit attributable to owners of the Company amounted to $14.6 million, compared with a profit of $14.2 million for the same period last year. This translated into total diluted earnings per share of $1.12 of which $1.07 was attributable to Class A Common Shares and $1.17 to Class B Subordinate Voting Shares. For the same period in 2017, diluted earnings per share totalled $1.10, of which $1.05 was attributable to Class A Common Shares and $1.16 to Class B Subordinate Voting Shares. “The outlook remains positive. Both our marine and environmental services segments are expected to have a strong finish, and we continue to look for new growth opportunities”, indicated Madeleine Paquin, President and Chief Executive Officer of LOGISTEC Corporation. LOGISTEC Corporation is based in Montréal (QC) and provides specialized services to the marine community and industrial companies in the areas of bulk, break-bulk and container cargo handling in 37 ports and 61 terminals across North America. LOGISTEC also offers marine transportation services geared primarily to the Arctic coastal trade and marine agency services to foreign shipowners and operators serving the Canadian market. Furthermore, the Company operates in the environmental services segment where it provides services to industrial, municipal and other governmental customers for the trenchless structural rehabilitation of underground water mains, regulated materials management, site remediation, risk assessment, and manufacturing of woven hoses.